I also had to do some quick on-phone consulting with mom as I wasn’t quite sure of the order in which to cook things. It’s a good thing I did, or I wouldn’t have known to boil the dough balls in water first. 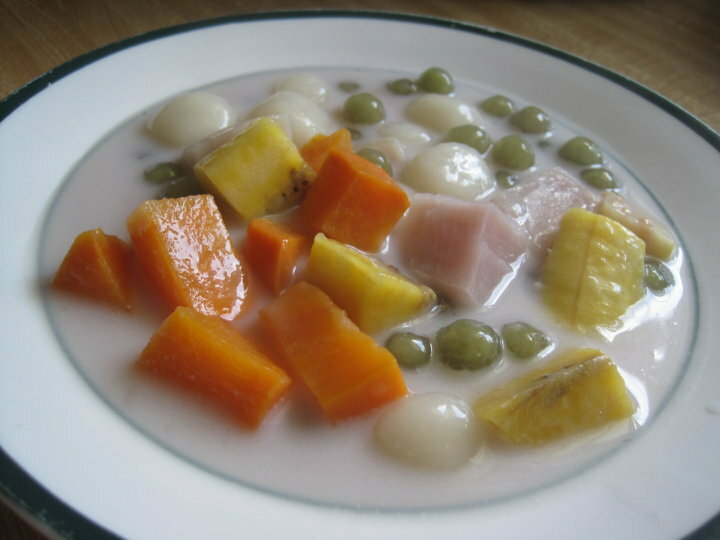 A common Filipino dessert and/or snack made with coconut milk, fruits and rice balls. To make the dough balls, moisten the rice flour with water just until it sticks together. Roll the dough into ¼ inch balls. Boil 6 cups of water in a pot, and when it comes to a rolling boil, gently drop the dough balls, stirring occationaly so they don't stick to the bottom of the pan or to each other. Cook until tender or until they rise to the top. By the time they are cooked, the water should be slightly thickened also. Add to this the coconut milk and let it come back to a simmer but not a rolling boil. A rolling boil will cause your coconut milk to separate, according to my mom. You can also add about ¾ cup of the sugar and a dash of salt. When it comes up to a simmer, add the sweet potatoes and plantains (saba if you can find it) and cook until they are tender. Add the tapioca pearls and adjust the sweetness to your taste. If you can afford extra richness, you may serve this topped with additional coconut cream. Yumm! This is how my mother told me to make it–to a tee. Thanks for the pictures. I’m klutzy in the kitchen, and I needed the visual aids. Will let you know how it turns out. and then youre not puting what kind of guinataan is this pls…. Thanks for the recipe, I was craving for it that I decided to check the internet and found yours. I can’t wait for the weekend to cook it. where and how did ginataan began? ey, anyone have idea where ginataan came from? where and how it started? Thks, for your lesson I did not Know what “Rolling boil” was, Iam traying translate it into Portuguese. HomeJewel, oh no! Yeah, you shouldn’t soak them or you will have jello. haha! No laughing matter though when you’ve spent so much time and effort cooking something and it doesn’t come out right. I followed a method that CeliaK had on her post which was from Wendy. Try it, it works really well. I actually just bought some more sago, the multi colored ones, and I can’t wait to try them! Hi HomeJewel, thanks! I’m glad you found our home on the web 😉 I hope you do get to try it. You are lucky you are probably close to all the authentic ingredients and won’t have to improvise like I do most of the time. I am so happy to have found this recipe! My husband and I lived outside Clark AB over 15 years ago and I used to buy guinataan from a street vendor. I’ve missed it all these years – especially the sweet rice balls. I can’t wait to try it. The pictures are great! isn’t it supposed to be bilo-bilo not bola-bola? My Grandma made ginataan only on our birthdays when growing up. She’s 90 years old now and want to make it for her. I tried looking for it, and found your recipe. Thank you so much! The picture itself made my mouth water. Ha, another idea for labor day! Slurp away, CeliaK! there’s plenty to go around 🙂 I actually ended up freezing half the pot, there is just too much for the girls and I to finish in a few days. My mom says she has frozen this before, so we’ll see how it is after a trip to the freezer. Hi drstel! that was news to me too, to boil it in water first. I always assumed you cook the whole thing in pure coconut milk. Mom said it will start separating if you cook the coconut milk for the length of time it would take to soften the balls. That looks so good! The bola bola is my favorite part! Hi There. Got here from Toni’s. I love guinataan! It’s been a long time since I’ve had this. Thanks for reminding me of this pinoy treat! Yehey!!! Those naughty, naughty girls! I wonder what shapes they’ll come up with next time, hehehe! But cute!!! Guinataan is indeed comfort food and it also varies between regions. If you can get some (canned) jackfruit and taro (gabi), add them to the recipe next time. But with or without them, this is perfect! oooh, i can almost taste the chewy dough and the sweet flavor. yum! Haay ang sarap naman, I need some right now ‘coz it’s been raining non-stop here. Pahigop nga – sluuurrrppp!! Thanks, Thess 🙂 Pilya sila, no? They said next time they want to do other shapes. Sacrilege! it wouldn’t be bolabola then, now would it? Hi Jun! kakatuwa ka talaga 🙂 Rolling boil means when the bubbles in the water are rolling and breaking through the surface. When the bubbles are just staying below the surface, staying pretty much in on place, that is a simmer. Uy! Ginataang halo-halo! That looks so tempting. 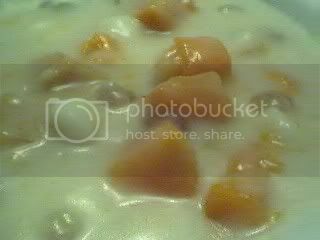 With all the rain we’re getting here in Manila of late, I’m suddenly craving for a nice big bowl of it! really yumm! i love guinataan. rolling boil? i have so much to learn jmom. my grandma’s ginataan, a perfect mirienda..looks gooooood, Jmom! !